We have a surplus of dedicated server inventory in New York and London. If you are looking for a dedicated server then this would be a great time to pick up one for 15% off. Use discount code “dedi15offspecial” to get 15% off recurring. Order a server here! Microsoft released new Windows updates yesterday. Looking at the list of updates this month there are none remotely exploitable externally (from outside the VPS) with the default configuration of our VPS. However, there are exploitable web browser vulnerabilities for Internet Explorer which could be remotely exploited if you visited a malicious website and were not updated yet. We advise minimizing your web browsing from your VPS for added security. Nevertheless, there are some important updates to also protect against local vulnerabilities including the usual cumulative update for Internet Explorer and Edge web browsers. Microsoft released new Windows updates today. Looking at the list of updates this month there are none remotely exploitable externally (from outside the VPS) with the default configuration of our VPS. However, there are remotely exploitable web browser vulnerabilities for Internet Explorer which could be remotely exploited if you visited a malicious website and were not updated yet. We advise minimizing your web browsing from your VPS for added security. Nevertheless, there are some important updates to protect against local vulnerabilities including the usual cumulative update for Internet Explorer and Edge web browsers. We’re proud to announce the launch of our new service whereby those who want one, can grab themselves a FREE BASIC + VPS! We’ve been working hard in building some exciting relationships with some very large and reputable brokers around the world. All you have to do is open an account, deposit $1,000 USD (or equivalent) and trade 15 standard lots per month for your VPS to be 100% free! Get in touch with us if you have any questions too! We have received reports of some Windows updates crashing VPS. We have confirmed it is 2 packages showing available in the Windows update optional section. These updates are not applicable to our VPS and are showing erroneously. 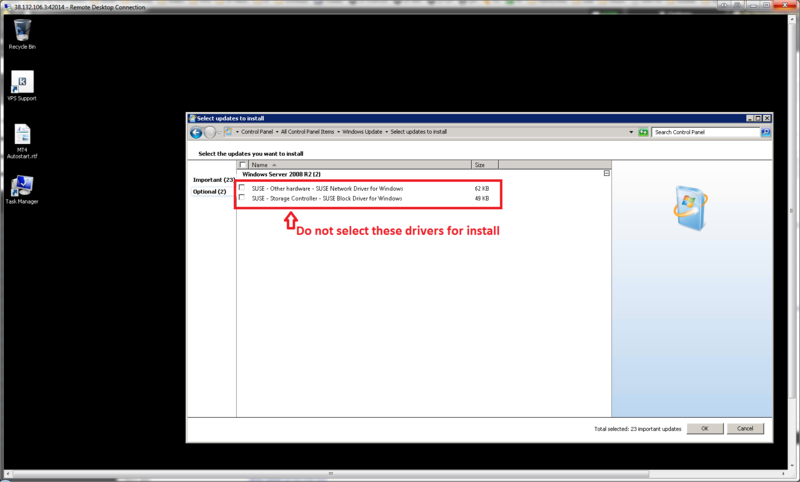 Please do not select these updates for install or it will crash your VPS requiring support to fix. You can right-click on each of the two updates and choose to hide them permanently.